Anthracite Grey Square Guttering 7016 112mm Square Guttering and down pipes. The dark anthracite colour also makes this the besty choine guttering for use with dark grey fascia boards Now available from stock. Description : Stylish Gloss Like Anthracite Grey Square guttering, 2m long x 112 mm wide x 60mm depth. Should be fitted at 1:350 fall for optimum flow rate. Manufacturer : Colour : 7016 Anthracite Grey Dimensions : 112mm Wide x 2m Long x 60mm D.. Description : Stylish Gloss Like Anthracite Grey Square guttering, 4m long x 112 mm wide x 60mm depth. Should be fitted at 1:350 fall for optimum flow rate. Manufacturer : Colour : 7016 Anthracite Grey Dimensions : 112mm Wide x 4m Long x 60mm D.. Description : Gloss Anthracite Fascia Bracket for use with 112mm Square Guttering. Fix at max 1m centers. Manufacturer : Colour : Anthracite .. Description : Gloss Anthracite In-Line Running Outlet for use with 112mm Square Guttering, connects to Standard Square Downpipe. Both sides fitted with Rubbers and Clips for a water tight seal. Manufacturer : Colour : Anthracite &nbs.. Description : Gloss Anthracite Stop End Outlet for use with 112mm Square Guttering, connects to Standard Square Downpipe. sidesfitted with Rubber and Clip for a water tight seal. Manufacturer : Colour : Anthracite .. Description : Stylish Gloss Like Anthracite Grey Square Gutter Angle 90 degree x 112 mm wide x 60mm depth. Angle : 90 Degree (Available in 90 120 or 150 degree angles. Colour : 7016 Anthracite Grey Dimensions : 112mm Wide.. Description : Stylish Gloss Like Anthracite Grey Square Gutter Angle 135 degree x 112 mm wide x 60mm depth. Angle : 135 Degree (Available in 90 120 or 150 degree angles. Colour : 7016 Anthracite Grey Dimensions : 112.. Description : Stylish Gloss Like Anthracite Grey Square Gutter Angle 120 degree x 112 mm wide x 60mm depth. Angle : 120 Degree (Available in 90 120 135 or 150 degree angles. Colour : 7016 Anthracite Grey Dimensions : .. Description : Stylish Gloss Like Anthracite Grey Square Gutter Angle 150 degree x 112 mm wide x 60mm depth. Angle : 150 Degree (Available in 90 120 135 or 150 degree angles. Colour : 7016 Anthracite Grey Dimensions : .. Description : Gloss Anthracite In-Line Union for use with 112mm Square Guttering, . Both sides fitted with Rubbers and Clips for a water tight seal. Manufacturer : Colour : Anthracite .. Description : Gloss Anthracite Stop End External for use with 112mm Square Guttering, fitted with Rubber and Clip for a water tight seal. Available : Internal and External Colour : Anthracite .. Description: Gloss Anthracite Stop End Internal for use with 112mm Square Guttering, (fits in to the running outlet, not into guttering) Available: Internal and External Colour: Anthracite .. Description : Stylish Gloss Like Anthracite Grey Square Down Pipe, 2.5m long x 68 mm wide Manufacturer : Colour : 7016 Anthracite Grey Dimensions : 68mm Wide x 2.5m Long .. Description : Stylish Gloss Like Anthracite Grey Square Down Pipe, 4m long x 68 mm wide Manufacturer : Colour : 7016 Anthracite Grey Dimensions : 68mm Wide x 4m Long .. Description : Stylish Gloss Like Anthracite Grey Square Down Pipe, 5.5m long x 68 mm wide Manufacturer : Colour : 7016 Anthracite Grey Dimensions : 68mm Wide x 5.5m Long .. Description : Gloss Anthracite Hopperfor use with 68mm Square Down Pipe, connects to Standard Square Downpipe. Manufacturer : Colour : Anthracite .. 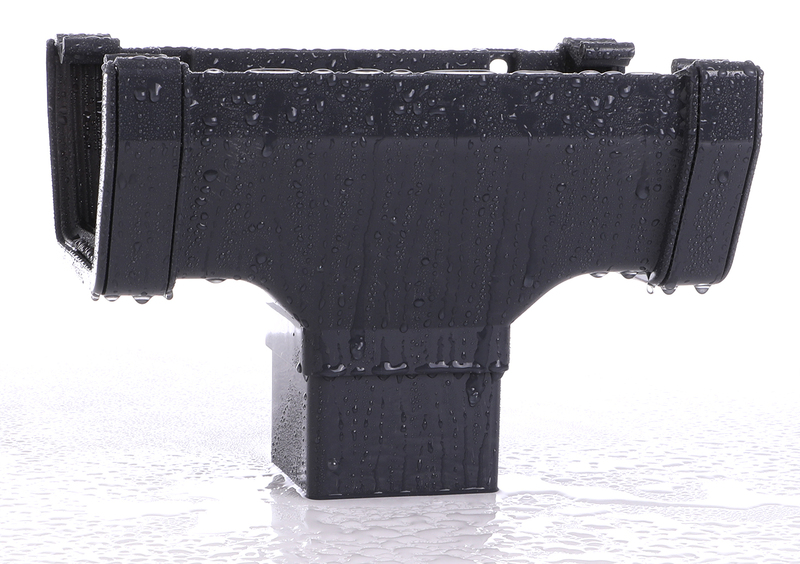 Description : Gloss Anthracite Down Pipe Clip Bracket Standard Stand Off for use with 68mm Square guttering. Fix at max 1m centers. Manufacturer : Colour : Anthracite .. Description : Gloss Anthracite 112 Degree Down Pipe Bend for use with 68mm Square Guttering, connects to Standard Square Downpipe. Manufacturer : Colour : Anthracite .. Description : Gloss Anthracite 92.5 Degree Down Pipe Bend for use with 68mm Square Guttering, connects to Standard Square Downpipe. Manufacturer : Colour : Anthracite .. Description : Gloss Anthracite Down pipe Shoe for use with 68mm Square Guttering, connects to Standard Square Downpipe. Manufacturer : Colour : Anthracite .. Description : Gloss Anthracite Down pipe Joint for use with 68mm Square Guttering, connects to Standard Square Downpipe. Manufacturer : Colour : Anthracite .. Description : Stylish Gloss Like Anthracite Grey Square Brach x 112 degree offset Colour : 7016 Anthracite Grey Dimensions : .. Description : Stylish Gloss Like Anthracite Grey Square Down To Round Converter 7016 Colour : 7016 Anthracite Grey Dimensions : ..